Ropes are used in countless different ways. Some people use ropes to tie down a tarp when camping or to provide support when climbing, whereas others use ropes in craft projects or as bracelets or belts. If you plan on using a rope for your next outdoor adventure or art project, it’s important to learn about the different types of rope that are available so you can choose the right one for the job. Chicago Canvas’s paracord is a kernmantle nylon rope, which means its interior core is protected by a tough, woven outer sheath. This layered design makes paracord durable and capable of carrying a significant amount of weight. Tactical cord has a similar layered nylon structure, however it has a four-strand interior core, whereas paracord has a seven-strand interior core. Braided utility ropes, however, are not made out of nylon, but rather multifilament polypropylene. Break strength is a term used to describe the amount of weight that the rope can safely support before it breaks. It’s important to research each type of rope’s break strength before deciding which one is right for you—especially if you plan on climbing or camping with it. All three of these ropes are capable of safely holding hundreds of pounds of weight. The tactical rope has a break strength of 275 pounds, which is impressive, but not when compared to the other options. Braided utility rope is capable of supporting up to 300 lbs. of weight, but the paracord’s unique layered design makes it the strongest of them all. This rope can safely support up to 550 pounds of weight without breaking. If you are in need of rope for climbing or camping, it’s best to choose paracord since it can support the most weight. Since many people use ropes outdoors, it’s important to know how each rope will hold up when exposed to environmental elements. Fortunately, each of these types is incredibly resistant to harsh environmental elements. Sunlight, rain, wind, and other environmental elements will not damage paracords, tactical ropes, and braided utility ropes. All three of these ropes are also mold and mildew resistant, so you will not have to worry about fungi growth even if the ropes are left in moist environments. Another factor to consider is the price of each rope. The price of each rope can vary depending on a number of factors, including the length, color, vendor, and availability. But in general, braided utility rope is the cheapest per foot. Tactical rope is not far behind braided utility rope in price, but paracord is the most expensive of the three. Don’t make this decision based on price alone. Keep in mind that price is only one of the factors you should consider when deciding on a rope. Many people are willing to pay the price for paracord because of the benefits that it offers. The color of the rope may not be important to someone who plans on using it to climb or camp, but it is important to those who want to incorporate a rope into their next arts and crafts project. Braided utility rope comes in two different colors: black and white. Paracord and tactical utility rope are both available in a wide range of colors, air force gold, neon green, and every other color in between. Some paracords and tactical ropes are sold in packs that contain ropes in several different colors. If you are interested in a bright or unusual colored rope, it’s best to choose either paracord or tactical utility rope. It’s hard to tie knots with thick ropes, but thin ropes are not nearly as strong or durable. For this reason, it’s wise to consider the thickness of each rope before making a final selection. Paracord is about 3/16 of an inch in diameter, which makes it thick enough to securely hold up to 550 pounds without breaking. However, the size may make it more difficult to tie tight knots with this rope. Tactical rope is smaller than paracord, measuring in at about 3/32 of an inch in diameter. This makes tactical rope ideal for tying knots or making lanyards or survival bracelets. The weight of the rope is another factor to consider when narrowing down your rope options. None of the ropes are necessarily heavy, however braided utility ropes are known for being especially lightweight. In fact, the multifilament polypropylene material that is used to create braided utility ropes is so lightweight that it can even float on water. If you are looking for the lightest rope possible, the braided utility rope is the best option for you. However, if weight is not a priority, any of these three ropes should work well. 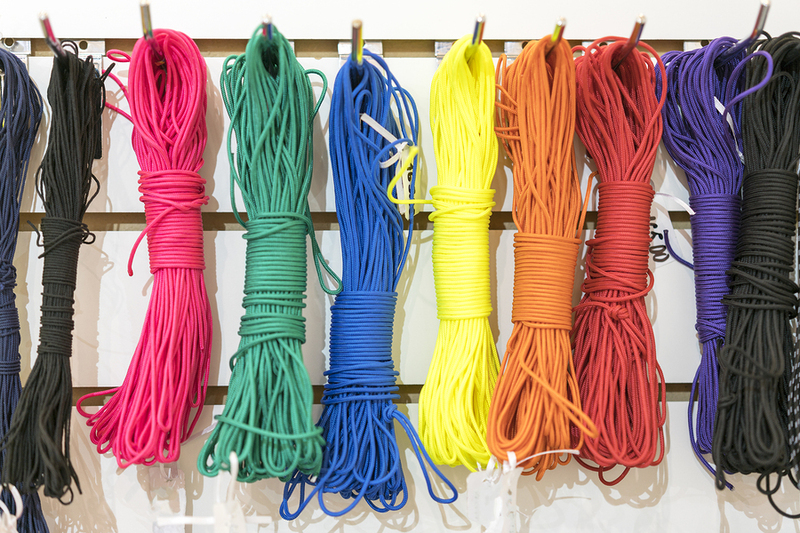 Fortunately, all three types of ropes are widely available at most craft and outdoor stores. You should not have to search high and low in order to find the rope you need for your next outdoor adventure or crafts project. If you’re interested in purchasing a paracord, tactical rope, or braided utility rope, contact Chicago Canvas & Supply for more information. We are your leading source for ropes, textiles, theatre fabrics, tarps, drop cloths, and more. Feel free to contact us to request a free sample of our high-quality products. To place a request for samples, contact us today by calling 1-866-389-2218 or emailing email@chicagocanvas.com. ← Fall Tarp Tips – Which Tarps Are Best For Preparing For Winter?